Scientists believe the earth's continents move through a process known as "platetectonics". This basically says the continents are like plates that float and move around on the molten rock beneath. 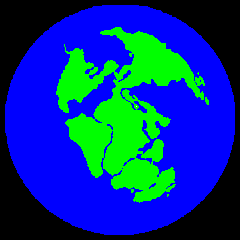 At the beginning of the Triassic (about 225 million years ago), all the earth's continents were combined in one massive super-continent, known as Pangaea. The fact that all the landmasses were joined together, easily allowed many species of dinosaurs to migrate around the world. 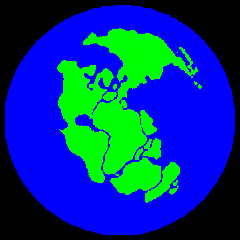 By the mid-Jurassic (about 200 million years ago), Pangaea had begun to break up. 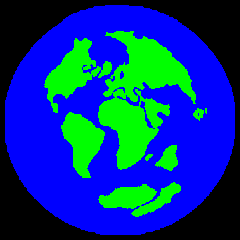 In the north, North America, Europe, and Asia were united in one giant super-continent, known as Laurasia. In the South, and South America, Africa, India, Australia, and Antarctica formed a second giant super-continent, which we know as Gondwanaland. Separating Africa and Asia, was the Tethys Sea (sometimes also known as the Tethys Ocean). Because seas divided Laurasia from Gondwanaland, migrating between them was no longer so easy, and dinosaurs in different parts of the world tended to evolve in divergent ways. By the early Cretaceous (about 135 million years ago), Europe and North America had started to separate, and the Atlantic ocean was beginning to appear. Meanwhile, Gondwanaland had broken up: Australia and Antarctica had split off, and India had begun its long drift North. By the end of the Cretaceous period (about 65 million years ago), when dinosaurs became extinct, the Atlantic had opened still further, and India continued drifting north. After the dinosaurs became extinct, the continents have continued moving until the present today, eventually arriving in the positions that we are familiar with. 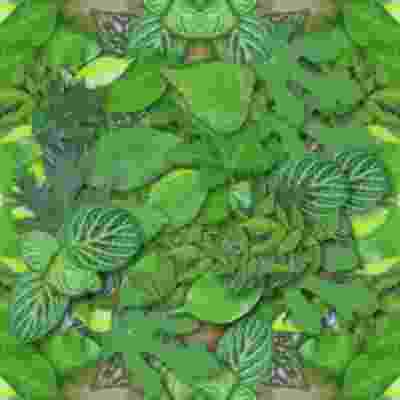 Just as animals have evolved, and different types of animals have dominated at different times, so with plants. During the Mesozoic Era, when dinosaurs dominated the Earth, there were no grasses for example! In the Triassic period (248 to 213 million years ago), the dominant plants were horsetails, ferns, ginkgos and conifers. In the Jurassic period (213 to 144 million years ago), the dominant plants were cycads, ferns and conifers. In the Cretaceous period (144 to 65 million years ago), the first flowering plants ("angiosperms") began to appear, including beech, fig and magnolia.